Popovers are magical. No yeast, baking powder, or baking soda, yet they rise into magnificent little porous creations, all thanks to the magic of steam! After whipping up the batter, I was curious how the thin, runny batter would morph into a puffy, muffin-like shape. Thanks to a high oven heat and the ratio of liquid to flour, the popovers release steam while cooking, puffing up to create a porous dough, bound together by the egg. So simple, yet so complex, and most importantly, so delicious! I might get hung for this, but I always find Yorkshire Puddings to be a bit boring and kind of bland, at least until you smother them with gravy. 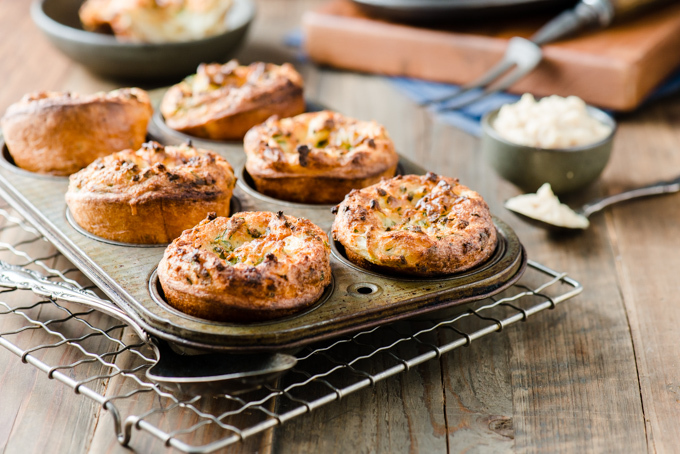 Rather than going that traditional route, I wanted to incorporate some flavour into a popover recipe (which are essentially the same thing as Yorkshire Pudding). It may have been a poor decision… They were way too good and we ate way too many. Oops! No gravy needed here. 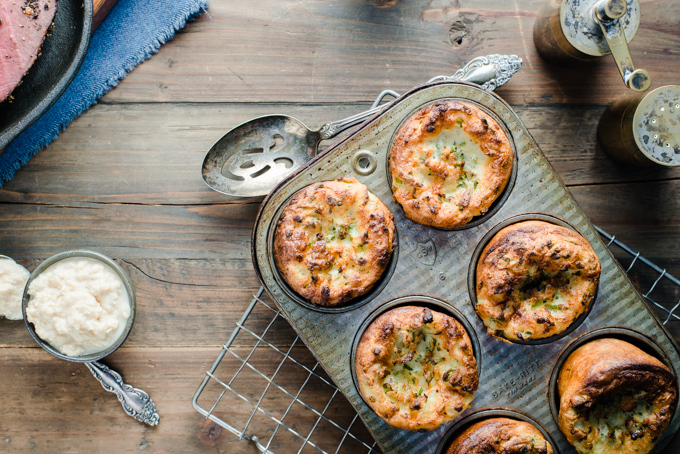 The only problem with these popovers, were how easy they were to make… Now I want them or lunch, dinner, and every snack. Heck, why not breakfast too? French toast popovers anyone?? Find the accompanying Sirloin Tip Roast recipe here. Simple to make, and even easier to devour! 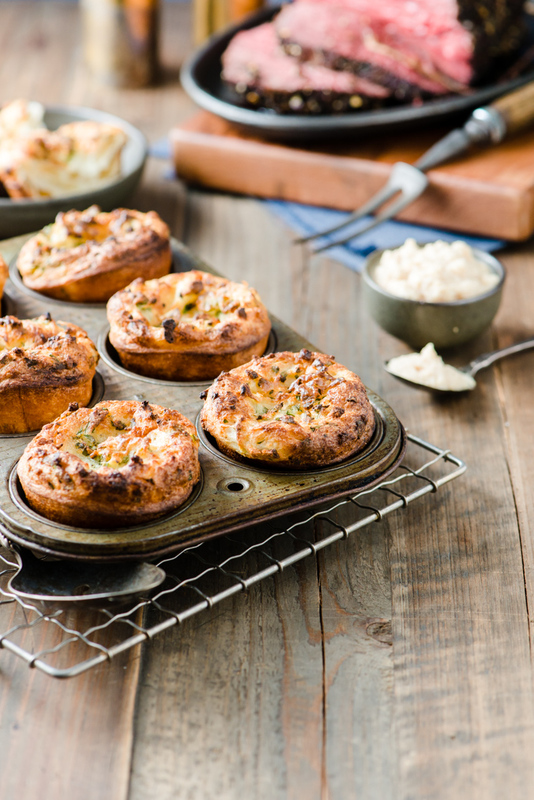 These Black Pepper & Chive Popovers will disappear in no time. In a 12 muffin tin, using 2 tablespoons of melted butter, add ½ teaspoon of butter into each muffin tin. Once buttered, pour batter into the muffin tins, filling each hole about three-quarters full. Bake about 30-35 minutes, until popovers have puffed up, and become golden brown. Wow, the photography is making me hungry. I can just imagine the texture. I will have to make these on an upcoming meatless Monday. Thanks Jake! They would definitely be perfect for meatless monday :). I’m not sure to be honest, but if anything they’ll probably just rise more than usual! OMG these are amazing, just made them for dinner tonight and already ate one……….I will definitely keep this recipe and pass it along……..thanks for sharing! Glad you like them Penny! We hope everyone else loves them too :). I made this and the accompanying roast recipe. My wife has consistently ordered this when we go to restaurants and I had never tried Yorkshire Pudding, and didn’t know what the big deal was… now I know. Thanks for the post and I’ve saved this with recipes that will frequent our table. Looks like a great recipe, but 1 Tbsp of Kosher Salt seems a bit extreme! Is that the correct amount? I used only 1 tsp of salt instead of 1 tbsp and they turned out fantastic! I’ll make them again for sure! Hi going to try and make the gluten free. Has anyone tried Yur recipe with gf flour and posted the results? Not that we know. If you have some success let us know! Help !! I’m making the popovers for dinner. Do I use seof-rising flour or not? I would use regular flour if you have it, but they should still turn out with self-rising flour. * I used 1% milk and it worked just fine, so if anyone doesn’t have whole milk, I wouldn’t stress it. 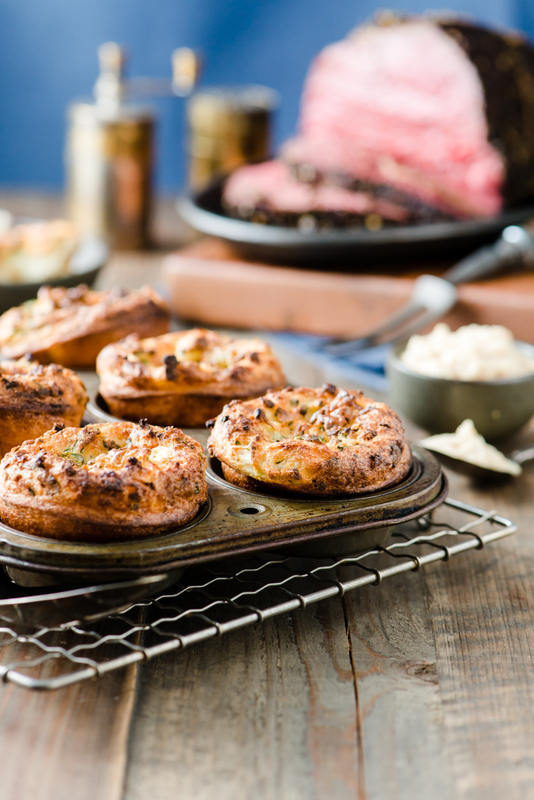 * I used melted bacon grease to grease the pans – about 3/4 tsp per cup…a trick I learned from a different popover/Yorkshire recipe, just adds an extra “oomph” of flavour. * I don’t know if my oven is hotter than others or if the bacon grease makes it all cook faster, but about 17 minutes in, these looked cooked and were almost as dark as your picture. I just shut off the oven and let them finish out the rest of the time with the door closed – they still turned out perfectly! Thanks for an amazing recipe…it’s going into my recipe box to stay! 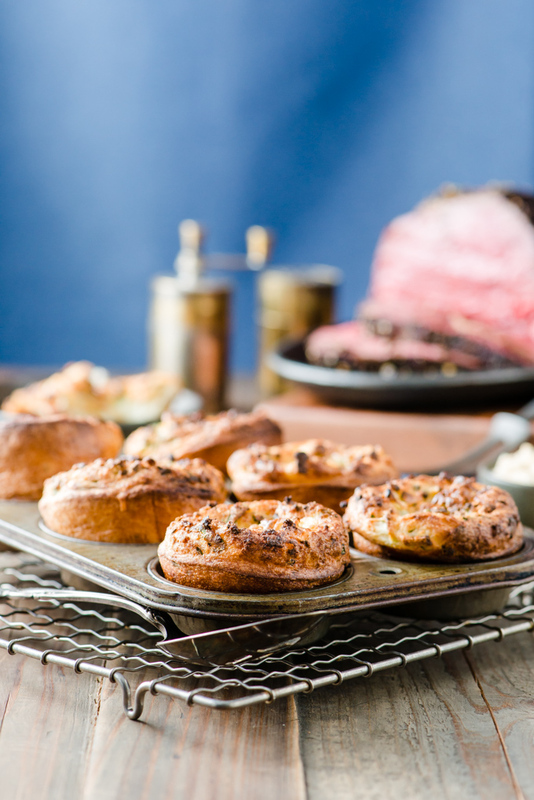 The temperature difference between the roast and the popovers….do you do the popovers earlier? Or are they best served straight out of the oven? If so do you leave the roast resting a bit more while the popovers bake?